The term "Expressionism" first emerged around 1910 as a way to classify new types of art that emphasized emotional impact over descriptive accuracy. Though many artists of the early twentieth century can accurately be called Expressionists, two groups that developed in Germany, Die Brücke (The Bridge) and Der Blaue Reiter (The Blue Rider), are among the best known and help to define the style. Not a term chosen by the artists, it describes art that emphasized the emotional impact over descriptive accuracy. Kandinsky’s work of “total art” combines both abstract and representational images with rhythmic, mystical poetry. In a series of multicolored prints, Nolde captured the awkward experience of watching a couple fight in public. Kirchner’s claustrophobic city scene reflects on a culture where everything is for sale. The body’s expressive contortions reflect sculptural tradition, but Schiele used it to express the interior self. 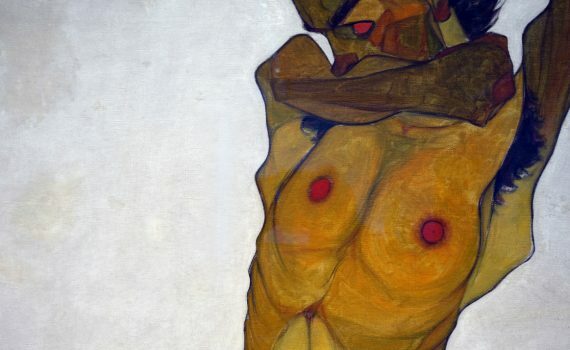 Is Schiele’s haunted figure meant to be a famed Austrian artist or Jesus Christ—or both? Jawlensky rejected the principles of his arts education in order to embrace Expressionism at its most extreme. Kirchner defines his city with only the figures: there is not a building in view. What would this painting sound like? Yes, you read that right – this canvas blurs the lines between senses. Kirchner is rendered unable to create or destroy in this nightmarish wartime painting.